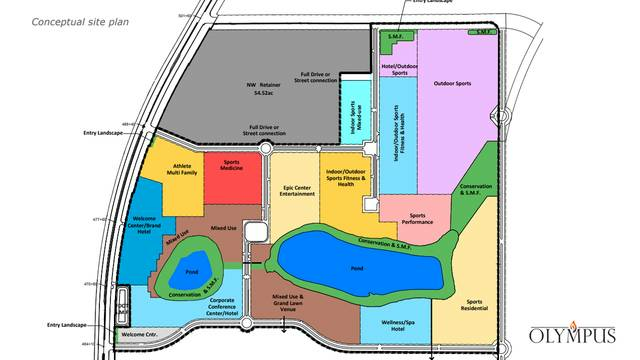 Multi-purpose 250-acre sports complex planned for Clermont area ! has ever seen,’ city leaders say ! CLERMONT, Fla. – Developers of the proposed Olympus sports complex told Clermont city leaders Tuesday that the project could lead to more than $1 billion in economic impact. City leaders got their first chance to look at plans to develop 250 acres in south Lake County, along Route 27 near Lake Louisa State Park. The land is currently an undeveloped orange grove. The city’s economic development director, Shannon Schmidt, has been working with developers on the proposed Olympus sports complex for nearly two years. The recently unveiled private development would feature a tennis complex, aquatic center, several hotels, restaurants, health care facilities and other sports training facilities. Developers said the complex will create nearly 6,000 jobs and pump more than $1.4 billion worth of economic impact into the community over 10 years. City leaders expect the developers to submit a proposal for annexation, as well as rezoning of the property and a large scale comprehension plan amendment, in September. Public hearings would then take place in October through the planning and zoning commission and city council. The five-phase project is expected to get underway in 2019 and be finished by 2025.